Kawaii Kitty is one of the latest Betsoft Gaming powered slot games to be released into the market. Since the game is developed by Betsoft Gaming, and since the game is from the Slots3 series, players can expect an immersive experience that comes in 3D visuals. The game is all about a cute kitty, called Kawaii Kitty, which is also the title of the game. Players will get to join this kitty for a purr-fect gaming experience that has a lot to offer to players. This includes great visuals, sounds, payouts and rewards. 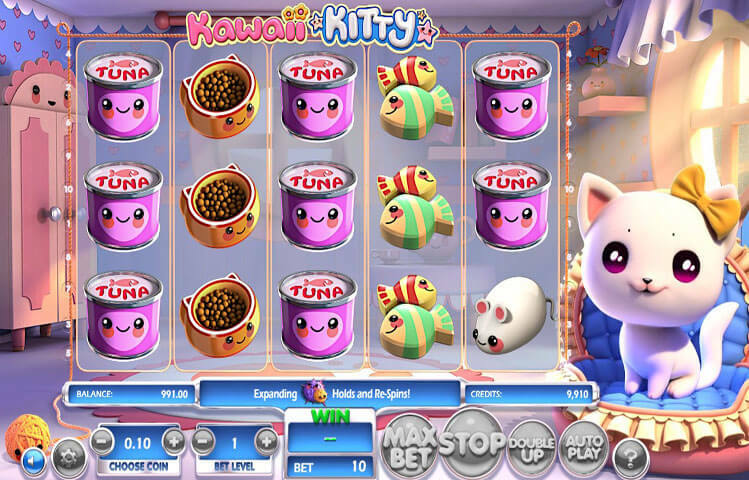 Kawaii Kitty is a five reeled game that has a total of 10 wager lines. Players will be able to place the wanted wagers on these lines as they toggle through the betting options that the slot has. There is the coin value, and the number of lines. This results in a betting range that is quite appealing to all kinds of players. This range lies between 0.02 and 100 credits for each spin of the slot’s reels. The rest of the control panel buttons can be found underneath the reels. They allow players to view the pays, spin the reels, and more. The game is called Kawaii Kitty, which is a very convenient name for the game since it is all about a small cute wide-eyed white kitty. Players will see that kitty on the right side purring and moving around as she joins them throughout the game play. All of the visuals and symbols of the game are inspired by that theme and they come in a cartoonish style. Kawaii Kitty’s visuals are top notch and come in 3D. This does not come to anyone’s surprise since the game is from the Slots3 portfolio of Betsoft Gaming. That is not all, as symbols appearing on the reels would turn into animations whenever they are a part of a winning combo. They can also turn into animations when a bonus feature becomes active. These symbols are inspired by the theme. This is why they include a ball of yarn, a tuna can, cat food, a white mouse, a bottle of milk, a comb and fish. The game has the Expanding Wild and Re spin feature. This feature can become active when players get the wild ball of yarn on the reels. This icon can only land on reels two, three and four. When that happens, an animation will be activated and the yarn will cover the entire reel turning it wild. This will also trigger a re-spin of all other non wild reels. This can happen up to 3 times to cover the 3 middle reels, and causing 3 re spins.